Moore’s Law, which predicts that the scale of electronic components will halve every two years, is hitting headwinds as chipmakers reach the limits of physical possibility. So instead of trying to miniaturize further, experimental physicist Sander Otte and his colleagues started from the bottom up: building a digital data storage device in which one atom represents one bit. Otte describes the device as an atomic-scale abacus or sliding puzzle. The findings appear in the journal Nature Nanotechnology. Sander Otte is an experimental physicist at Delft University of Technology in Delft, Netherlands. 51 years ago Gordon Moore, the co-founder of Intel, made a bold prediction. He predicted that the computing power of computer chips, the number of transistors you could fit on a piece of silicon, would double every two years. In other words, advances in miniaturization would move very quickly at an exponential rate. His prediction struck such a nerve that it became known as Moore’s law. And yes, we’re still talking about it decades later. But today we find ourselves in a bit of a conundrum. Chip-makers have done such a good job of miniaturizing technology that Moore’s law has hit a headwind, because there’s only so much smaller we can get before quantum hell breaks loose and the physics of these systems break down. So my next guest decided, instead of miniaturizing, how about starting, just starting with the very smallest component possible and working your way back? And start with the atom. He and his team succeeded in building a data storage device that uses individual atoms for bits. Sander Otte is an experimental physicist at the Delft University of Technology in the Netherlands. His research is in this week’s issue of Nature Nanotechnology. Welcome to Science Friday. IRA FLATOW: Good afternoon. Tell us about what you built. You started with individual atoms, and how did you build it? How does it work? SANDER OTTE: Right. Let’s compare it to an ordinary hard disk. So on an ordinary hard disk you store bits. Those are information bits that can be either zero or one. And those are basically chunks of magnetic material on a disk that can magnetize either with their north pole one way or the other way. And that’s the zero or the one. But each of those bits still contains thousands or ten thousands of atoms. So if you want to increase the capacity of such a disk, you would have to make those bits much smaller, right? Now, we did exactly the same thing as that, except that we stored the bits in individual atoms. So you should compare its– you should see it as follows. We have a crystal surface on which we have a perfect grid of chlorine atoms. It’s a square grid, so it’s perfectly smooth. However, there are some atoms missing from the grid, so they look like holes. And then just like it’s a sliding puzzle, where one piece is missing, and you can slide a piece that is adjacent to a hole towards the hole. And that’s how we store the zeros and the ones. So on every site on that grid there is either an atom or not, so it’s perfectly digital. And that’s how we store the zeros and the ones. IRA FLATOW: And you have to do this at very cold temperature, right? SANDER OTTE: That’s correct, yeah. So as a physicist, we gauge how stable a material is by how warm you can make it before the atoms start to move by themselves. Because if you heat something up, the atoms essentially start to move by themselves, and at some point they become so much that you lose the data. It becomes scrambled by that. IRA FLATOW: This is not to be confused with a quantum computer, correct? SANDER OTTE: That’s a very good point. Yes. This is a classical storage of information. So each bit is either one or zero, and in a quantum bit it can be a combination of one and zero. That’s not the case here. IRA FLATOW: But you’re working on the quantum level. Doesn’t quantum stuff sneak in at that level? SANDER OTTE: That’s a very good question. So if you look at these atoms– so, if you think about what makes something quantum, right? In order for something to be quantum, it should be well isolated from its environment. So as soon as the environment kind of probes the quantum object, it forces it to choose either of the two states that it can be, and so it loses its quantum nature by interacting with the environment. Now, these atoms that are in the surface, they are very tightly bound to their neighbors and to the substrate. So they are really very well in contact with their vicinity, and therefore they can absolutely not retain any quantum uncertainty for any serious amount of time. So it’s really a classical bit of information. IRA FLATOW: So you’re not worried about sneaking in, getting to some level where you’re going to be dealing with these quantum weirdness things. SANDER OTTE: Well, I’m not sure worried is the right word. I would love to see quantum effects. Actually, my background research is in precisely these kind of quantum effects. So this whole research on the kilobyte that we now made, this memory storage, is kind of a sidestep for me. Normally what I’m interested in is to explore the transition from quantum effects to classical physics. So if you think about it, a single magnetic atom– for example, an iron atom– is a quantum object. So it can have a superposition of having its magnetization pointing one way and the other. We call it a superposition of spin up and spin down. Now, if you put a second iron atom adjacent to it and they couple together, they are still a quantum object. They are, for example, up-up, or down-down, or up-down, and down-up. Still quantum because they can be both at the same time. But if you add more atoms to it, at some point the atoms collectively decide to form a classical system. So at some point– and this is a gradual process– at some point they collectively decide, hey, let’s just force ourselves to point one way and be a classical thing. And exactly that transition is something that fascinates me a lot and I’ve been studying in recent years. IRA FLATOW: So, when do we get a practical– what do you call this computer? A micro– what’s the term you’re using? SANDER OTTE: I call it a memory. It’s really a storage device. So it doesn’t compute. It’s not a transistor. A transistor would have to have an input, an output, and a gate, so that it has a certain functionality. Here it’s just a storage of information. IRA FLATOW: So you have a three-dimensional, like a crystalline structure, with the atoms and all the different parts of the crystal? SANDER OTTE: Well, actually we only use the surface of the crystal. So yes, the crystal itself is a three-dimensional object, but then we cut that crystal at a perfectly flat edge. And it’s actually a copper crystal, so it’s copper atoms that we start with. And on top of this copper crystal we deposit, in vacuum, a layer of chlorine atoms. And these chlorine atoms, they form together with the copper basically a salt, so it’s an ionic bond. And that turns out to have very nice properties for this kind of data storage. It’s a very reliable self-terminating coverage of chlorine atoms. IRA FLATOW: And how much data can you store? What is the potential for this? SANDER OTTE: So we went up to a kilobyte, which is a lot compared to previous attempts. So let’s take a few steps back. So, the first time that atoms were moved was back in the early 1990s, by a team at IBM. 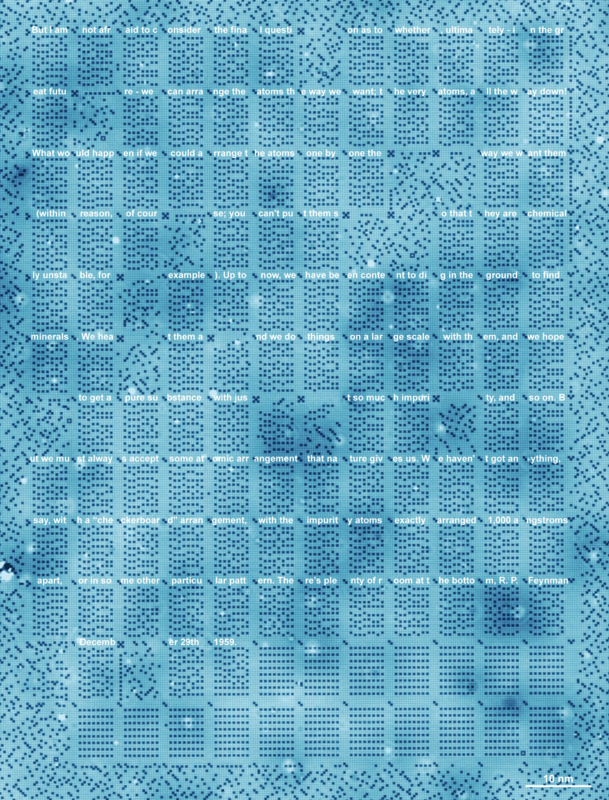 And then they wrote this iconic picture, the letters IBM with 35 xenon atoms. That was a tremendous achievement for that time. In the quarter century that follows, the technique didn’t change that much. It was all the time, it was just a very manual, painstakingly slow labor to put all these atoms where you wanted. And so you could at most get a handful of atoms in place. Now, what we figured out now, is with this particular surface, and with the particular techniques we’re using, with these holes rather than the atoms, that we basically have the atomic-scale printing press. So all of a sudden we can scale this up to thousands of atoms, even ten thousands of atoms, and that’s how we stored a kilobyte. 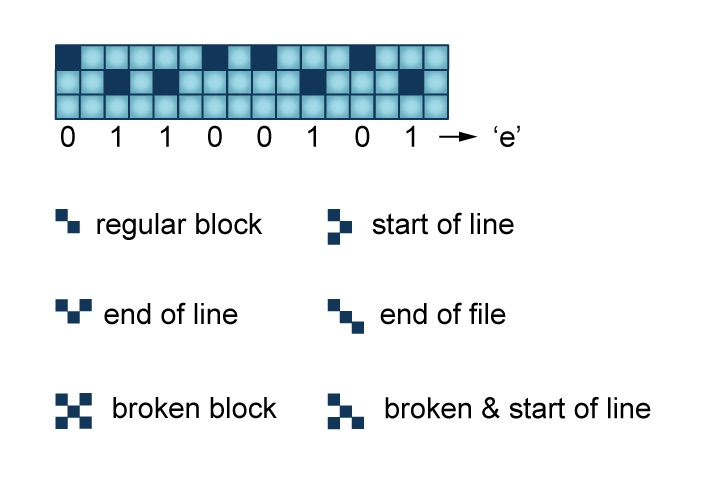 So a kilobyte is 1,000 bytes, and a byte is eight bits, so these are 8,000 bits. However, I think that there is no physical limitation that would disable us from going much bigger than this still. IRA FLATOW: So you could make, in a tiny little space, you can store the equivalent of many volumes of books, or whatever you’re storing. SANDER OTTE: Right. So one estimation we made is that if you would scale this up still two-dimensionally to the size of a post stamp, the area of a postage stamp, that would be enough surface to keep all the books ever written by mankind written out. Now, however, that is, of course kind of a silly comparison, because we are never actually going to make this to a postage stamp size. At least I don’t think so, that we’re going to do this in a short time. But it just shows you how tremendously small all this is, and what the capabilities of this technology can be. IRA FLATOW: So what is, if you’re not going to go in that direction, what direction do you want to take this, and what is the reason for constructing this? SANDER OTTE: Yes. So, to be very honest, the data storage is of course an example that we made because it’s something people can relate to and it’s a beautiful image, and it’s a story that’s easy to tell. But to me personally, as a scientist, as a physicist, there’s a much deeper message here, which is that for the first time in history, we are able to construct objects at a scale that was just inaccessible before. If you look at the scan that we made of that full kilobyte, you see that we created order in a chaos at a level that we never were able to create order in chaos. And I think this really opens the door to all kinds of experiments and also technologies that involve playing with the positions of the atoms in a material. And in the end, that is also what determines how a material behaves. So all the properties that a material has on the macroscopic scale, find their origin and how the atoms interact. And once we can start to play with that on the scale that we now did and with the level of reliability that we now did, I think there is a tremendous world of possibilities. SANDER OTTE: Right. So, there is a saying among physicists that more is different. So, “more is different” means that even if you would know the exact laws of quantum physics that tell you how atoms behave, you still wouldn’t be able to predict exactly how materials would behave if you would have thousands of these atoms. The reason for this is that the number of constituents and the number of levels of freedom, degrees of freedom, is so huge that even the smartest people in the world that have access to the best computers in the world would not be able to predict what’s going to happen. So at this scale of thousands or ten thousands atoms, all kinds of properties emerge that you cannot predict out of quantum mechanics. And these phenomena that you study, they kind of require their own language, their own pictures. It’s really a field of itself, a field of study of itself, where we can learn a lot. IRA FLATOW: But you don’t know yourself where it’s going to end up or what you might come up with. SANDER OTTE: Certainly not. I think I’ve got some examples though, right? So, a nice example is superconductivity. Superconductivity is an effect that happens in some materials when you cool them down to very low temperatures. And that is intrinsically a quantum effect. So it’s one of these quantum effects that do not die out, even though you go to larger scale. They just retain their quantum nature. And in superconductivity, a material basically loses all its electrical resistivity. So it’s a very useful idea. Now, we know to some extent how this arises, but in many materials, we actually don’t know how it comes about. So if we can start to play, and build basically materials ourselves, rather than be limited to the materials that nature provides us, but you start to build the materials yourself– you choose yourself which atom goes where– you might learn about the emergence of these kind of phenomena like superconductivity. I’m not saying necessarily superconductivity, of course. But that kind of stuff is what becomes available when you start to tinker with the material on the atomic scale. IRA FLATOW: Dr. Otte, very fascinating. And we wish you great luck, and you’ll come back on and tell us when you get your next step, OK? SANDER OTTE: Thank you, I will. IRA FLATOW: Sander Otte is an experimental physicist at the Delft University of Technology in the Netherlands. We’re going to take a break. When we come back, we’re going to talk about, you know bubbles that people live in where politics are concerned? Well, what happens when you live outside the bubble among people that you disagree with? We discuss some new and interesting research. It’s all happening after the break, so come on back. We’ll see you after the break. Stay with us.